Fred and Fritz pose here just before FPB wrapped up their gig in Beaver Dams, NY on July 14, 2007 at the Blanchard Homestead. Rick gets silly for the camera on July 14th in Beaver Dams, NY. 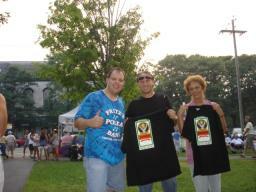 Ken (the guy that booked FPB), Frank, and Fred are shown here in at the Blanchard Homestead on July 14th. 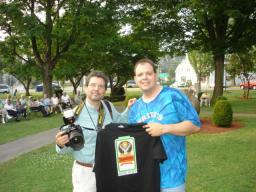 Gabe is pictured here with Ken (the guy that booked FPB) on July 14, 2007 in Beaver Dams, NY. 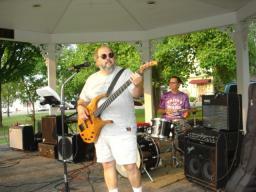 Frank brought out his vintage Les Paul Gibson for the FPB gig at Lock #20 in Marcy, NY on July 12, 2007. Fred is pictured here at Lock #20 on July 12th in Marcy, NY. 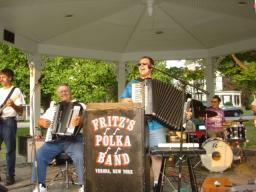 Fritz and Gabe are shown here during FPB's gig on July 12, 2007 in Marcy, NY. 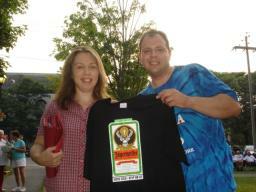 Fritz presents a Jagermeister t-shirt on July 10th to his great friend of many years, Derek Rich, and to Derek's Mom. Derek (who now lives in Arizona) used to be FPB's Roadie and Official Photographer, before he moved. An action shot of Gabe and George, taken in Clinton, NY on July 5, 2007.